Dietary long-chain polyunsaturated fatty acids (LC-PUFA) are of crucial importance for the development of neural tissues. The aim of this study was to evaluate the impact of a dietary supplementation in n-3 fatty acids in female rats during gestation and lactation on fatty acid pattern in brain glial cells phosphatidylethanolamine (PE) and phosphatidylserine (PS) in the neonates. Sprague-Dawley rats were fed during the whole gestation and lactation period with a diet containing either docosahexaenoic acid (DHA, 0.55%) and eicosapentaenoic acid (EPA, 0.75% of total fatty acids) or α-linolenic acid (ALA, 2.90%). At two weeks of age, gastric content and brain glial cell PE and PS of rat neonates were analyzed for their fatty acid and dimethylacetal (DMA) profile. Data were analyzed by bivariate and multivariate statistics. In the neonates from the group fed with n-3 LC-PUFA, the DHA level in gastric content (+65%, P < 0.0001) and brain glial cell PE (+18%, P = 0.0001) and PS (+15%, P = 0.0009) were significantly increased compared to the ALA group. The filtered correlation analysis (P < 0.05) underlined that levels of dihomo-γ-linolenic acid (DGLA), DHA and n-3 docosapentaenoic acid (DPA) were negatively correlated with arachidonic acid (ARA) and n-6 DPA in PE of brain glial cells. No significant correlation between n-3 and n-6 LC-PUFA were found in the PS dataset. DMA level in PE was negatively correlated with n-6 DPA. DMA were found to occur in brain glial cell PS fraction; in this class DMA level was correlated negatively with DHA and positively with ARA. The present study confirms that early supplementation of maternal diet with n-3 fatty acids supplied as LC-PUFA is more efficient in increasing n-3 in brain glial cell PE and PS in the neonate than ALA. Negative correlation between n-6 DPA, a conventional marker of DHA deficiency, and DMA in PE suggests n-6 DPA that potentially be considered as a marker of tissue ethanolamine plasmalogen status. The combination of multivariate and bivariate statistics allowed to underline that the accretion pattern of n-3 LC-PUFA in PE and PS differ. Nutrient supply is of crucial importance in the maturation and functional development of the central nervous system . Long-chain polyunsaturated fatty acids (LC-PUFA) such as arachidonic acid (ARA, C20:4n-6) and docosahexaenoic acid (DHA, C22:6n-3) are major constituents of membrane phospholipids in the brain and the retina . It has been shown that the level of DHA in retinal phospholipids has a strong impact on visual transduction processes and subsequently to visual function assessed by electroretinography [3, 4]. Beside their structural implications, biologically active derivatives of LC-PUFA such as neuroprotectins and resolvins, are involved in neuroprotection, signalling and maintaining or lowering the inflammatory response [5–7]. ARA and DHA can be synthesized from dietary essential fatty acids: linoleic (18:2n-6, LA) and α-linolenic (ALA, C18:3n-3) acids, respectively, through a series of elongation and desaturation steps catalyzed by the same key enzymes, namely Δ6- and Δ5-desaturases . Therefore, the level of LA and ALA in the diet is very important to ensure adequate deposition of LC-PUFA in membrane phospholipids in the neonate [2, 8–10]. However, it has been demonstrated in many neonate animal models that the rate of conversion of ALA to DHA is not appropriate to sustain optimal DHA accretion in the brain and the retina just after birth [11–13]. Nevertheless, the DHA supply is a key factor for the ocular and cerebral development steps that take place during the last trimester of pregnancy in humans . It has been demonstrated that the maternal conversion rate of ALA to DHA is not sufficient to fulfil the needs of the foetus . Therefore, it is currently recommended to consume LC-PUFA rich foods during pregnancy and lactation in order to deliver the optimal level of DHA to the foetus . It has been demonstrated that maternal supplementation with n-3 LC-PUFAs might positively influence cognitive performance in infants  but the number of conclusive reports in this area is limited. In a recent study, Bowen and Clandinin  clearly demonstrated that dietary supply of DHA is more efficient than ALA to increase the DHA level in brain (cerebrum plus cerebellum) glial cell phospholipids in rat neonates during lactation . Glial cells are important support to neuronal cells and especially for neurotransmission, neuroprotection, energy maintenance and supply of key elements . It has been shown that glial cells are able to convert fatty acids and synthesize LC-PUFAs while it is not the case for neuronal cells . The present study has been carried out with the same experimental design except that the nutritional intervention started earlier, i.e. during gestation, and was maintained throughout lactation. This design allows to study the effect of the maternal nutrition along all the stages of neurodevelopment that started in utero and are almost completed at weaning in rat . Maternal milk compositions have been assessed by analyzing gastric content of neonates two weeks after birth. Analysing the fatty acid composition of the gastric content gives insight on the maternal milk composition. The fatty acid composition of phosphatidylethanolamine (PE) and phosphatidylserine (PS) brain glial cells has been assessed in 14 days rat neonates. 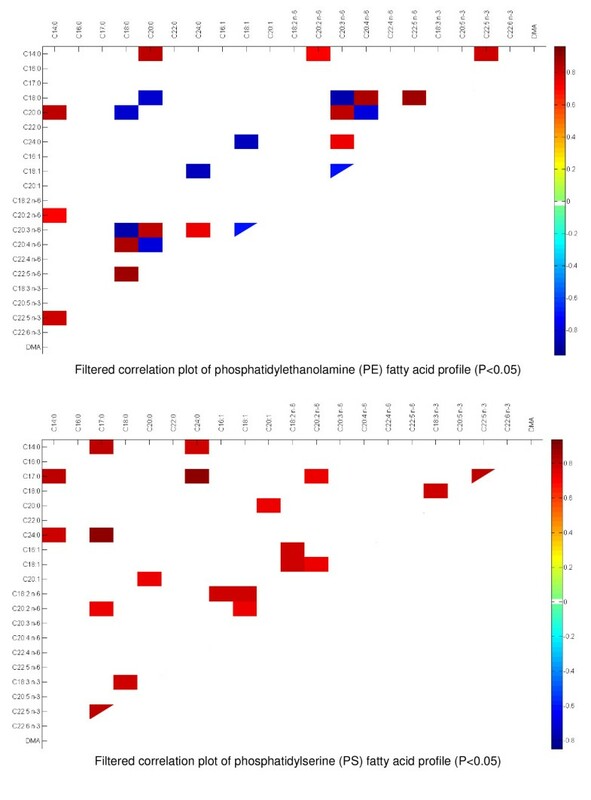 A combination of multivariate and bivariate statistics has been used to better exemplify how n-3 fatty acids, supplied in the maternal diet as precursor (ALA) or LC-PUFA (EPA and DHA), impact fatty acid pattern in brain glial cell PE and PS, the two main classes of phospholipids rich in LC-PUFA. The protocol was conducted following the Guidelines for the Care and Use of Experimental Animals and approved by the local ethical committee. Sprague Dawley rats (11 weeks of age) were mated for a period of 10 days (1 male + 1 female per cage) at INRA (Animal Breeding House, INRA Research Center, Dijon, France) under controlled conditions for light (lights on, 7:00 AM-7:00 PM), temperature (22 ± 1°C) and hygrometry (55-60%). Water and food were supplied ad libitum to the animals from the first day of the mating period until the end of the suckling period. At day 1 after parturition, the number of pups was adjusted to 10 neonates per litter. Mortality of the pups was recorded daily after parturition until the end of the follow-up. Pups were weighed once a week. The composition of the diets and the n-3 fatty acid content of dietary fat is provided in Table 1. The relative distribution of fatty acid classes was similar to that described by Bowen and Clandinin . Basically, the ALA lipid blend contained rapeseed oil (27.1%), cocoa butter (23.4%), coconut oil (18.7%), high-oleic sunflower oil (15.9%), and sunflower oil (14.8%). The n-3 LC-PUFA lipid blend was composed of rapeseed oil (21.6%), cocoa butter (21.6%), coconut oil (19.2%), high-oleic sunflower oil (17.4%), sunflower oil (15.0%) and fish oil (5.2%). Male pups were euthanized at day 14 after birth (n = 24 in each group). Brains (cerebrum plus cerebellum) were excised and placed in ice-cold 0.32 M sucrose as previously described [10, 17]. Six brains from pups at day 14 were pooled together for glial cell separation. A total of 4 pools were prepared and used as a starting material for glial cell isolation. The gastric content of pups sacrificed at day 14 after birth was removed and stored at -80°C until further analysis. Glial cells were purified from the whole brain (cerebrum plus cerebellum) by centrifugation as described in the literature . Briefly, pooled brains were homogenized in 7.5% (w/v) polyvinylpyrrolidone and 10 mM CaCl2 at pH 4.7 and 25°C. The homogenate was layered on a two-step sucrose gradient of 1.0 and 1.75 M. After centrifugation at 41,000 g for 30 min at 4°C, glial cells were isolated from the interface of the 1.0 and 1.75 M sucrose layers. Lipids were extracted from brain glial cells and gastric content according to the Folch procedure . Phospholipids from brain glial cell lipid extracts were separated by preparative HPLC using a Lichrosorb Si60 (5 μm, Merck) fitted with a light-scattering detector as described in the literature . Fractions containing PS and PE were collected and stored at -80°C under inert nitrogen-conditions before fatty acid analysis. Fatty acid methyl esters (FAME) were prepared from gastric contents following the methods of Glass  while for the experimental diets and glial cells, the method described by Morrison and Smith  was used. FAME samples were analyzed by gas-liquid chromatography using a fused silica capillary column (CP-Sil 88, 100 m × 0.25 mm id, 0.25 μm film thickness, Varian, Les Ulis, France) operating under conditions described elsewhere [22, 23]. Fatty acid profile of pup's gastric content, PE and PS brain glial cells were analyzed by ANOVA procedure, followed by post-hoc Dunnett's test, using the SAS software (SAS Institute, Cary, USA). Differences were considered as significant at P < 0.05. PCA was used to analyze the fatty acid profile of PE and PS purified from brain glial cell samples. Data pretreatment, correlation analysis and Principal Component Analysis were done on Matlab™ 7.5 (The Mathworks, Inc., MA, USA). In-house written routines were used for data import and visualization, whilst preprocessing, correlation analysis and PCA modeling were done using the PLS-Toolbox v 5.22 (Eigenvector Research Inc., WA, USA). Supplementation with n-3 LC-PUFA during gestation did not modify any characteristics of the newborn rats compared to the control group in terms of number of pups per litter, weight and growth of the rats during the first two weeks of age of the pups (Table 2). No significant differences were observed between both groups of animals, neither at the time of parturition nor at weaning. Data on reproduction efficiency and weight of animals at birth and during the first two weeks of age. In the present study, lipid represented about 40% of the energy provided by the experimental diets (Table 1). This level reflects the energy coming from lipids in typical US diet and was previously used in similar studies by Bowen and Clandinin . The fatty acid distribution of the experimental diets is provided in Table 3. The ALA diet does not contain any n-3 LC-PUFA while the lipid fraction of the n-3 LC-PUFA experimental diet contains EPA and DHA (0.75 and 0.55% of total fatty acids, respectively). The level of saturated, monounsaturated and polyunsaturated fatty acids were balanced in both experimental diets to c.a. 37-38, 42-43 and 20% of total fatty acids, respectively. The n-6 to n-3 fatty acid ratios were 8 and 5 for the ALA and n-3 LC-PUFA experimental diets, respectively (Table 3). Fatty acid composition of the experimental diets. Results of duplicate analysis are expressed as g/100 g total fatty acids. The analysis of the fatty acid composition of gastric content of rat pups is commonly used to assess the fatty acid composition of the maternal milk . The detailed fatty acid distribution in the different groups corresponding to neonates from mother fed with the ALA or n-3 LC-PUFA diets is provided in Table 4. Statistical analysis revealed that rat pups from ALA group received more medium chain fatty acids C8:0 (+23%, P = 0.002) and C10:0 (+40%, P = 0.001), palmitic (C16:0) acid (+11%, P = 0.001), palmitoleic (C16:1 n-9) acid (+46%, P = 0.006), C22:4 n-6 (n-6 DTA, +125%, P = 0.001) and C22:5 n-6 (n-6 DPA, +200%, P = 0.003) from maternal milk compared to n-3 LC-PUFA group (Table 4). Conversely and as expected, the gastric content of the pups from the n-3 LC-PUFA group received more EPA (+83%, P = 0.0003), C22:5 n-3 (n-3 DPA, +68%, P < 0.0001) and DHA (+65%, P < 0.0001) than pups from the ALA group. In addition, the levels of stearic (C18:0) acid (+16%, P = 0.002) and ALA (+24%, P = 0.007) were significantly higher in the n-3 LC-PUFA group. Fatty acid composition of the gastric content of rat pups at 14 days of age (g/100 g total fatty acids). The fatty acid composition of the PE classes (left columns in Table 5) was characterized by a high level of ARA and DHA that represented together more than 40% of total fatty acids. The level of ARA, and n-6 DPA found in rat neonates from dams fed with n-3 LC-PUFA was lower compared to the ALA group (P < 0.001). The most important variation observed was the increase of DHA (+18%, P = 0.0001) and dihomo-γ-linolenic acid (C20:3 n-6, DGLA) (+22%, P = 0.0018) in the n-3 LC-PUFA group. The level of dimethylacetals (DMA) that derived from the Sn-1 vinyl-ether residues in PE plasmalogens was higher in rat neonate from the n-3 LC-PUFA group compared to the other group of animals (+12%, P = 0.0155). Effect of maternal dietary -linolenic acid (ALA) compared to n-3 LC-PUFA (EPA+DHA) on the polyunsaturated fatty acid and DMA composition of phosphatidylethanolamine (PE) and phosphatidylserine (PS) in brain glial cells of pups (g/100 g total fatty acids). Data obtained from four pools of 6 brains excised from rat pups at 2 weeks of age. The fatty acid composition of the PS classes (right columns in Table 5) was characterized by high levels of ARA, n-6 DTA and DHA. The level of DHA was significantly increased in the n-3 LC-PUFA group (+15%, P = 0.0009) while the level of n-6 DPA was much lower in the LC-PUFA group (-47%, P < 0.0001) compared to the ALA group. The levels of other n-6 LC-PUFA were not significantly different between groups but the n-3 to n-6 ratio was significantly higher (1.84 ± 0.11) in rat neonates from dams fed with n-3 LC-PUFA compared to the ALA group (1.37 ± 0.06, P = 0.0004, data not shown). The fatty acid composition of the PE was analyzed by PCA. Data were arranged in a set of rows (samples) and columns (variables). Variables contained quantitative values of the different fatty acids (data expressed as g per 100 g of fatty acid) including DMA (sum of individual DMA). Afterwards, data were arranged in a second time, for both n-3 LC-PUFA and ALA group samples, to help in the determination of the differences between the two groups. The data set obtained was analyzed by means of PCA. Data were pre-processed, each variable was centred and scaled to unit standard deviation in order to harmonize the contribution of all the variables. The optimal number of parameters of the model (Principal Components) was obtained after internal cross-validation. In these conditions, a one principal component model was determined to be optimal. This component explained a 41.77% of total variance in the data (Figure 1A). The second principal component explained intra-class variation and accounted for 20.86% of total variance (Figure 1A). PCA scores plot. Discrimination between n-3 LC-PUFA and ALA groups based on phosphatidylethanolamine (PE) and phosphatidylserine (PS) fatty acid profiles. 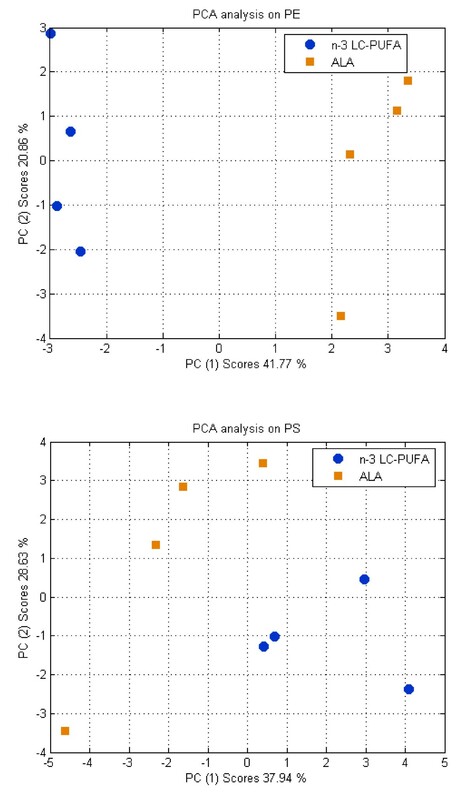 The analysis of the PCA scores of the first principal component 1 (PC1) showed a clear discrimination between both groups of samples issued from n-3 LC-PUFA and ALA groups (Figure 1A). To determine the contribution of the variables to this model, PC1 loadings were analyzed (Table 6). This analysis highlighted the major contribution of C14:0, C20:0, C24:0, C18:2, C20:3 n-6, C22:5 n-3, C22:6 n-3, and DMA to the profile representative of n-3 LC-PUFA class. On the contrary, compounds like C18:0, C18:1, C20:4 n-6, and C22:5 n-6 were relevant for the characterization of the ALA group. PCA Loading values for models on PE (41.77% total X-Variance) and PS (37.94% total X-Variance, PC1/28.63% total X-Variance, PC2) data. Following the same internal validation procedure as for PE data, PCA on PS data showed a model with two principal components, thus reflecting some more complex structure. As shown in Figure 1B, discrimination was also possible along the PC1 (37.94% of total variance), but now with some relevant information explained by PC2 (28.63% of total variance). In this case, the analysis of the influence of the variables on the model was done by plotting the loadings of the first two components (Table 6). Accordingly, the n-3 LC-PUFA group was mainly characterized by its contents in C18:0, C16:1, C18:2 n-6, C18:3 n-3 and C22:6 n-3. Alternatively, fatty acids such as C14:0, C16:0, C20.0, C20:1, C20:5 n-3, C22:0, C20:4 n-6, C22:5 n-6, C22:5 n-3 and DMA explained the variability observed in the ALA group. Correlation analysis was applied to PE and PS data to identify possible correlations between fatty acids from the brain glial cell data set. To discard non-significant associations, filtering based on significance at P < 0.05 was applied to the correlation coefficients (Figure 2A). Correlation matrix on phosphatidylethanolamine (PE) and phosphatidylserine (PS) fatty acid profiles. Results filtered according to significance level (P < 0.05). From the filtered correlation matrix, it appears that in the PE data set, DHA (-0.9404), n-3 DPA (-0.8385) but also DGLA (-0.9366) are negatively correlated with ARA. DGLA is positively correlated with n-3 DPA (0.8937) and DHA (0.9618). As expected, n-3 DPA and DHA are also positively correlated by each others (0.8909). ARA is negatively correlated with its precursor C18:2 n-6 (-0.7602) and positively correlated with its elongation/desaturation product n-6 DPA, (0.9394). From this analysis, it is also possible to identify positive correlation between EPA and its precursor ALA (0.8722) but also with C20:2 n-6 (0.7392). This analysis allowed to identify significant negative correlations between the level of DMA (plasmalogen derivative) and n-6 DPA (-0.783) and C18:0 (-0.718). PS fatty acid profile data set was also processed and data were filtered based on the significance level at P < 0.05. The analysis (Figure 2B) shows less correlation and the significant ones were different when compared to the PE data set. It was possible to determine that ARA and DHA provide significant correlations (0.7218 and -0.7422, respectively) with serine derived plasmalogen DMA. In addition, EPA was found to be positively correlated with n-3 DPA and negatively correlated with DHA (0.9372, -0.8364). In the present study, the effect of ALA supplementation has been not studied using a control group depleted in n-3 fatty acids. The effect of various amount of ALA on fatty acid distribution in rat neonates had been already studied and it has been clearly demonstrated that ALA supplementation does not significantly modify the level of the main n-3 LC-PUFA in brain glial cell PS and PE . The main objective of the study was to compare the effect of ALA and n-3 LC-PUFA supplementation on the fatty acid composition of brain glial cells PS and PE with emphasis on n-3 LC-PUFAs such as DHA and DMAs. It has been recently shown that DHA may act as synaptic regulator in astrocytes  and therefore its level might influence important function such as neurotransmission which is a key function of glial cells [24, 10]. DHA accretion in PE and PS brain glial cells is crucial during the first two weeks of life in rats . The metabolism of PE and PS in neural cells has been extensively investigated over the past few years and it has been shown that PE can be converted into PS (and vice et versa) and that DHA containing PS species are involved in neuronal survival and differentiation [see reference for an extensive review . As described in the literature , the analysis of the gastric content of pups sacrificed at day 14 revealed that mother milk derived from dams fed with n-3 LC-PUFA contain higher level of n-3 fatty acids (ALA, EPA, n-3 DPA and DHA) than milk deriving from dams fed only ALA (Table 4). The level of n-3 fatty acids was two times higher in the gastric content of rat pups in the n-3 LC-PUFA group than in the ALA group. In the ALA group, the n-3 LC-PUFA in the gastric content derived from the maternal conversion of ALA and in some extend may originate from n-3 LC-PUFA stores in maternal adipose tissues. However, in the n-3 LC-PUFA group, DHA and EPA mainly derived from the maternal diet. Therefore, the ALA supplied through the maternal diet was not extensively metabolized which results in a higher level of ALA in the gastric content compared to the ALA group (Table 4). The transfer of n-3 fatty acids and especially DHA from the dams to the pups was higher in the n-3 LC-PUFA group and can explain the higher DHA level observed in brain glial cell PE and PS (Table 5). The PCA analyses performed on the PE and PS fatty acid profiles clearly demonstrated how the lipid composition of maternal diet and especially the supply with different n-3 fatty acids might impact the FA composition of the brain glial cell PE and PS of rat neonates (Figure 1). The effect of supplementation with DHA on the balance between n-6 and n-3 fatty acid and especially the level of ARA and n-6 DPA in various tissues is well documented [2, 10, 26]. The present approach combining bivariate and multivariate statistics allowed to identify discrete correlations between the different PE and PS residues (Figure 2). We observed numerous correlations between the n-3 and n-6 LC-PUFA in the PE data set. The PE correlation matrix clearly demonstrated that n-3 LC-PUFA are negatively correlated with ARA and its elongation/desaturation product n-6 DPA but positively correlated to DGLA as previously reported in the serum and the retina [27, 28]. ARA and EPA are formed from DGLA and 20:4 n-3, respectively through a Δ5 desaturase activity. It is well known EPA inhibits Δ5 enzyme activity which is necessary to convert DGLA into ARA [27, 28]. It might explain why n-6 PUFA are favored whereas those formed downstream are limited when EPA is provided by the diet. This analysis also confirmed that n-6 DPA and DHA are negatively correlated (-0.9476); which confirms existing literature showing that n-6 DPA is a good marker of DHA deficiency [10, 25, 28, 29]. Interestingly, the correlation analysis revealed that the level of plasmalogen residues (plasmenylethanolamine DMA) was negatively correlated with n-6 LC-PUFA (Figure 2), but not significantly correlated with any n-3 LC-PUFA. DMA represent about 8-9% of total PE residues (Table 5). It has been shown that deficiency of n-3 fatty acids in the diet may result in plasmalogen deficiency associated with abnormal signal transduction process in neural membranes . Conversely, dietary supplementation with DHA to Zellweger patients whose tissues are strongly deficient in DHA  increased plasmalogen levels in erythrocytes . The present observation might indicate that n-6 DPA level can potentially be used as an indicator of plasmenylethanolamine (PE plasmalogen) deficiency in brain glial cells. The results of the analysis of the PS correlation matrix showed no correlation between n-6 and n-3 LC-PUFA (see the blank squared areas in the correlation matrix). EPA was positively correlated with its metabolite n-3 DPA but not with the end product DHA. Fatty acids up-taken from the general circulation or de novo synthesized were incorporated in PE but as well in phosphatidylcholine (PC) by deacylation/reacylation reaction . However, PS are selectively produced from PE by serine exchange-catalyzed reaction . The only noticeable correlation observed in the PS dataset is related to DMA level that are negatively correlated with DHA (-0.7422) and positively with ARA (0.7218). This might indicate that serine plasmalogen might contain significant levels of ARA in the Sn-2 position of the phosphatidylglycerol backbone. DMA represent 1.5 to 2.2% of the residue found to be linked to PS in brain glial cells (Table 5). Few reports mention the occurrence of serine plasmalogen in human erythrocytes [33, 34] but, to our knowledge, serine plasmalogens have never been characterized in neural cells. It appears from these analyses that ethanolamine and serine plasmalogen might differ in their compositions and subsequently, one can hypothesize that they might differ in their metabolism and function. The different phases of brain development occur differently in rats and humans. At birth the first two steps of early gliogenesis and macroneurogenesis are complete in rats whereas they happen during the first six months of gestation in humans . It has been demonstrated in newborn rats that the DHA requirements at 2 weeks of age are very important . This period corresponds to the microneurogenesis, late gliogenesis and microneurogenesis. At this stage, the level of DHA accretion is high in whole brain glial cell phospholipids as well as in isolated PE and PS . It has been clearly shown that dietary DHA is more efficient than dietary ALA to sustain this demand . Our results confirm that early supplementation of maternal diet with n-3 LC-PUFA affects the fatty acid composition of PE and PS brain glial cells during their initial developmental steps. The results of the present study confirm that the lipid composition of the maternal diet during gestation and lactation have a significant impact on the fatty acid composition of brain glial cell PE and PS in the neonates. The combination of multivariate and bivariate statistics allowed to better understand how n-3 fatty acids supplied in the maternal diet as precursor (ALA) or LC-PUFA (EPA and DHA) influence the fatty acid profile of brain glial cell PE and PS in the neonates. In PE, n-3 and n-6 LC-PUFA are correlated, consistently with literature but the correlation analysis of PS residue profile did not show any correlation showing their distinct metabolic pathways. Negative correlation between n-6 DPA, a conventional marker of DHA deficiency, and DMA in PE showed that potentially n-6 DPA can be considered as a potent marker of ethanolamine plasmalogen. In addition, we observed in this study that serine plasmalogen occur in brain glial cells of rat neonates and that the level of DMA residue is negatively correlated with DHA but positively correlated with ARA. This might indicate that serine plasmalogen might contain significant level of ARA in the Sn-2 position of the phosphatidylglycerol backbone. The skilful assistance of Patrick Tassin and Laurence Decocq for taking care of the animals at the animal breeding house (INRA, Dijon, France), and Xavier Blanc for preparing the diets (UPAE, Jouy-en-Josas, France) is greatly acknowledged. Research supported by the Nestlé Research Center. The present research was supported by the Nestlé Research Center. LB, FDe, NA, CJ, FJ, J-BB., CH and FDi designed and directed the study. LB, NA, CJ, FJ and BP conducted the animal trial and the analysis. LB, IM and SR performed the statistical analysis and all the authors were implicated in drafting and finalizing the paper.